Weighing a sprightly 7.9kg (17.4lb) and costing a not-outrageous £1850, the TCR Advanced 2 is the second bike in the second range of Giant's road armoury, and one aimed squarely at competitive riders with a bit of money to spend. Spec-wise It's an out-of-the-box solution for road racing or fast sportives: you get a full Ultegra groupset, Mavic Aksium Race wheels and very decent finishing kit from Race Face and Fizik among others. All this is hanging off the full carbon TCR Advanced frame which is a chunky looking affair that's built with an exacting eye and plenty of attention to detail. 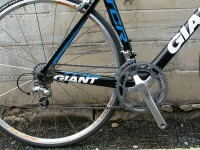 New technology wise, Giant seem to have concentrated on transferring rider input as efficiently as possible. They've christened the bottom bracket and chainstay section the PowerCore claiming 'unrivalled' stiffness, though it's not the first time we've heard that claim! Certainly the whole section is massively oversized and feeds into the enormous down tube; the GIANT logo almost looks like it's referring to the size of the tube rather than the make of the bike. 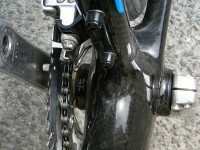 The headtube junction has also been worked on for this incarnation and Giant have a moniker for that too: OverDrive. 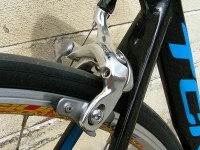 The aim is to improve the steering of the bike without adding any weight. 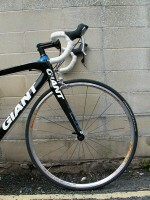 Giant are one of a growing number of manufacturers using an asymmetric headset with a 1.125" top race and an oversized 1.25" fork crown, again to beef up stiffness. 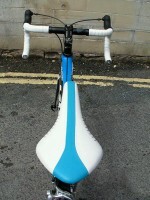 There's a nod to aerodynamics though it's certainly not the most aero road bike you'll see. The seat tube and seat post are flattened (and scalloped around the rear wheel) and the rest of the frame nicely scuplted, although that huge down tube is going to shift some air about. 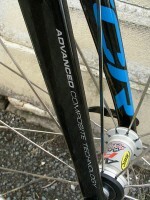 As you'd expect from the people that first brought you compact geometry it's, erm, compact geometry. 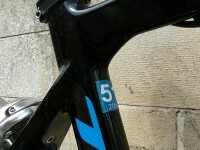 The drop on the sloping top tube isn't as pronounced as it used to be in the Mike Burrows era, though, so the sizing comes up a little bigger than some with the mid sized frame (M-L) measuring in at 53.5cm for an effective top tube of 57cm.